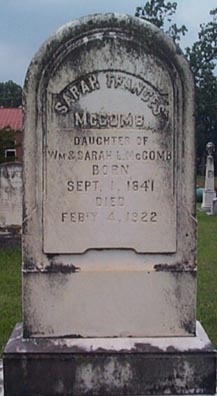 Sarah Frances "Fannie" McComb was born September 1, 1841 and died February 4, 1922. She was the daughter of William McComb and Sarah Lewis "Sally" Hughes McComb, and the sister of Elizabeth Jane McComb Witt. She is buried at Tinkling Spring Presbyterian Church Cemetery in Fishersville, VA.